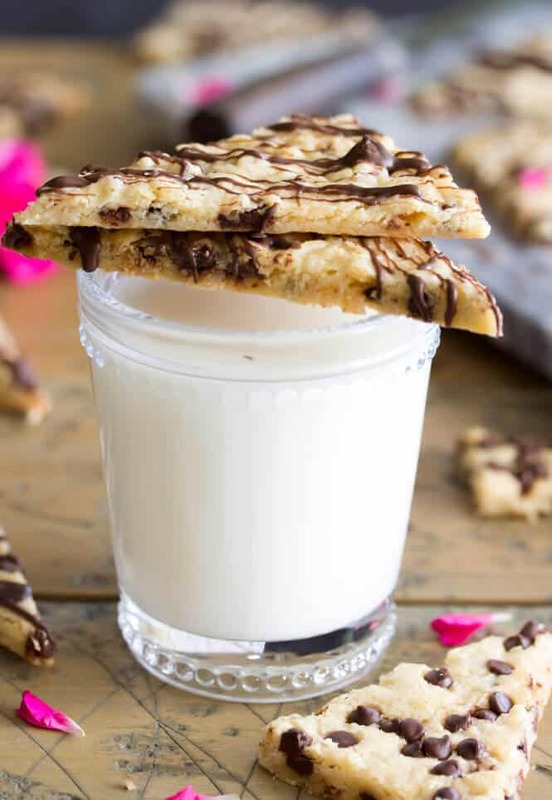 A sweet, snappy cross between brittle candy and classic chocolate chip cookies, this chocolate chip cookie brittle is a perfectly simple, unique treat and unlike any cookie (or candy!) you’ve had before. I have something new/old for you today. This chocolate chip cookie brittle was one of my earliest recipe adventures back in 2015, (complete with not-so-great, 2015 photos) and this weekend I felt that it needed to be resurrected. I’m not sure if I made this decision because I was really regretful about the old photos and the fact that nobody seemed to want to pin them on Pinterest, or because I just wanted an excuse to make chocolate chip cookie brittle, but here we are, and despite a brand new chocolate stain on my favorite Under Armour sweatshirt, I’m pretty happy to be here. Let’s discuss this cookie brittle, shall we? I shared a brownie brittle recipe with you not too long ago, but this is fairly different than that in a few ways. For one, it’s slightly thicker, and secondly, this has some “candy” elements to it (thanks to the condensed milk that makes up a significant percentage of the ingredients) that the brownie brittle lacks. 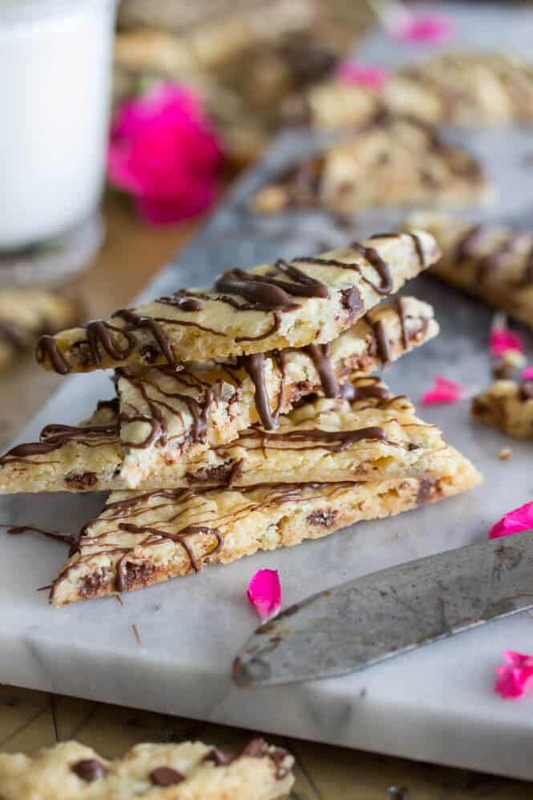 This chocolate chip cookie brittle is crisp and, well, brittle on the first bite (especially the end pieces, which turn golden brown in the oven and are certainly snappy), but then, like peanut brittle, it becomes chewy and a little sticky on your teeth as you chew. It’s a texture quite unlike any other cookie recipe I’ve ever shared, and certainly unique. This chocolate chip cookie brittle recipe calls for two 13×9 pans, but if you only have one (like I do…!?) you can spread the second half of the batter onto a cookie sheet, spreading it to about 1/4″ thickness. 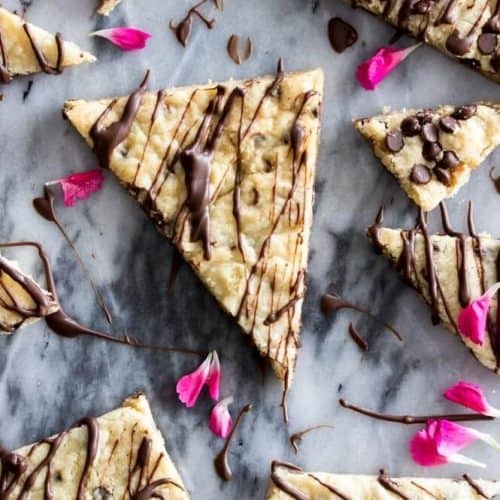 Once it’s done baking, allow the brittle to cool for just a few minutes before scoring with a pizza cutter or knife, and then allow it to cool completely before drizzling with chocolate and consuming. If you wait until it’s cooled completely to cut it, you’ll get jagged, crumbly edges, and I definitely prefer the sleek look you get by cutting it while it’s hot. I do recommend allowing the brittle cool completely before eating it, though, because it has a weird, sticky texture while it’s still warm. Preheat oven to 350F (177C) and line two metal 13x9 pan with parchment paper (if you don't have two 13x9 pans, you can use one 13x9 and one cookie sheet, which is what I usually do). In KitchenAid stand mixer or using an electric mixer, beat the softened butter until creamy. Add condensed milk and sugar and beat well. Scrape down the sides and add vanilla extract and beat on low. Gradually add in flour and salt until combined. Scrape down the sides of the bowl as needed. Spread half of the batter into prepared 13x9 pan (this can be tricky, especially with the slippery parchment paper. I use the back end of a spoon to press it into the pan and then lay a sheet of wax paper over the top and use my hands over the wax paper to press the batter evenly into the pan) and the remaining half into your other prepared pan (or spread evenly (about 1/4" thick) over parchment paper-lined cookie sheet). Bake (one pan at a time) on 350F (177C) for 20-25 minutes (until edges are golden brown). Cool for five minutes and then use a sharp knife or pizza cutter to cut shapes into the brittle (I just slice it into triangle shaped place). 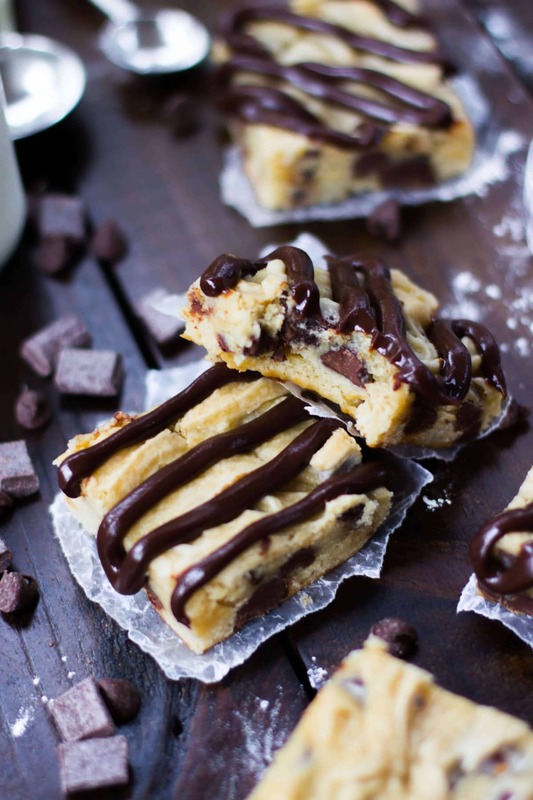 Do not try to separate the pieces, just score the marks and then allow the cookie brittle to cool completely. 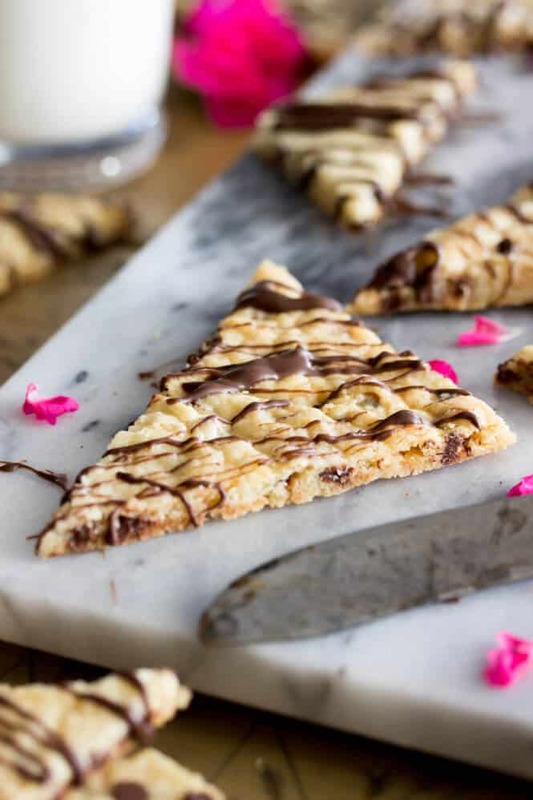 Once cookie brittle has cooled, break apart pieces on the scored lines. Prepare melting wafers according to package instructions and use a spoon to drizzle melted chocolate over the surface of the cookie brittle. Allow chocolate to harden before enjoying. I love your description of the texture of this brittle! It sounds SOOO yummy! My jaw just dropped! Looks awesome! A must try! You have combined two of my favourite things – pinned! Recipes like this scare me; mostly because I know my weaknesses. Forming Chocolate chip cookies into a brittle is one of the most brilliant and tasty creations I have seen. Ever! Love this post! What a great idea! 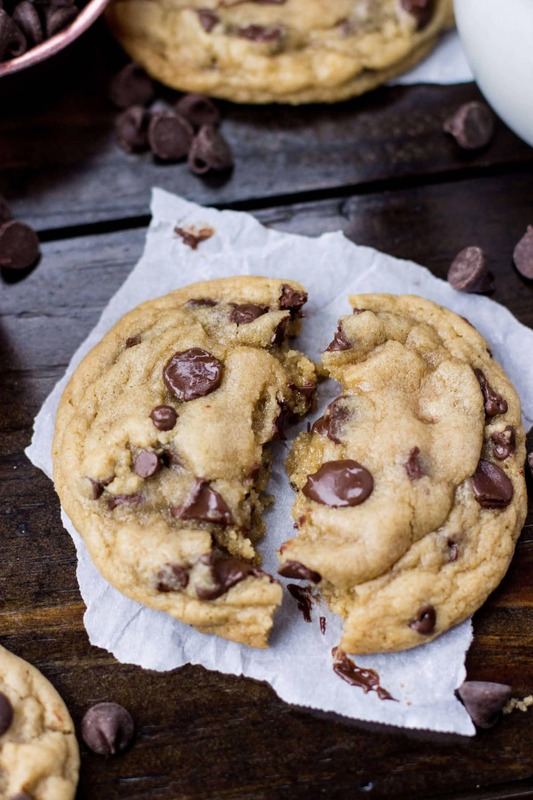 I can never resist chocolate chip cookies but this brittle looks even better. I love the crispy texture and chocolate chips! Must make these. Thank you!!! Baking is such a great escape from other work. I mean, it’s hard work, especially when a candy thermometer is involved, but it’s GOOD work. And this brittle is perfect! So much better than the stuff you buy in a store. It looks seriously addictive! Thanks Mir! Have a great weekend! Such a good idea! I love it. I think I’ll make some as a snack for the weekend… cuz I can’t control myself around cookies and it will be gone in no time 🙂 Great recipe! I love this idea, though I know I’d totally eat a whole pan of this!! It looks delicious! Haha it’s hard not to eat the whole thing. Thanks Sues! This looks AMAZING! I am always seeing brownie brittle around the store these days, but this looks even better! Yummy :). What an awesome idea! I wouldn’t pass too much time deciding whether it was a cookie or a confection, because I’d be too busy stuffing my face 🙂 Pinning! Baking definitely helps calm me down on stressful days still and easy recipes are always my favorite! 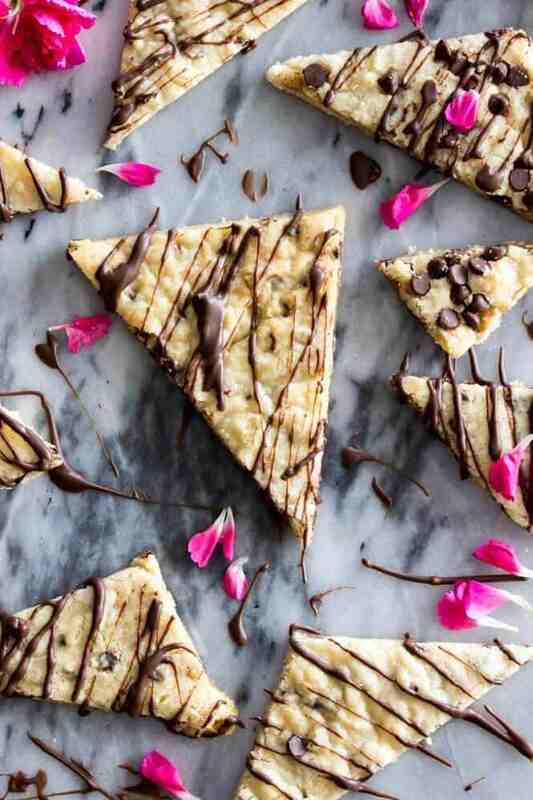 Love this fun and creative cookie brittle! It sounds like the perfect sweet treat! Oh what a fun recipe, Sam! 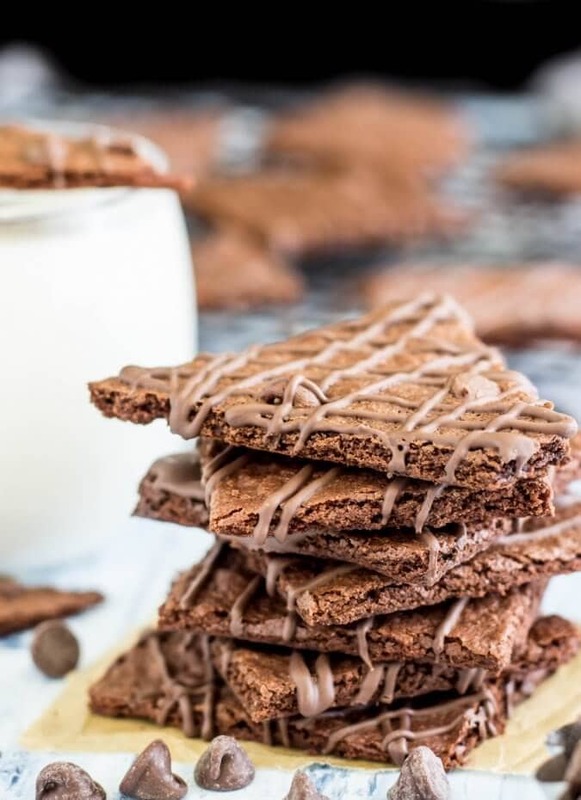 Brownie brittle is my absolute favorite, so I’m loving this chocolate chip version! So creative and sounds so delicious!